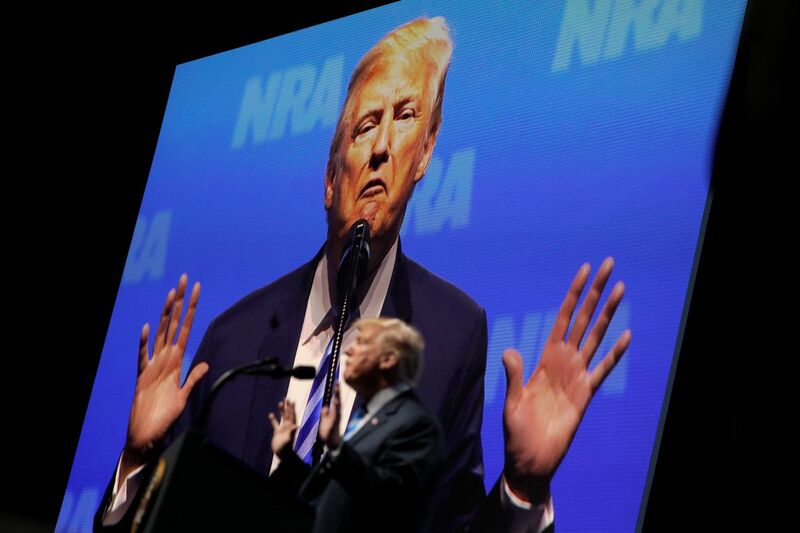 DALLAS – President Donald Trump on Friday addressed the National Rifle Association's annual meeting here in a speech that served as a rallying cry to his base, an attack on his detractors and a signal of his strong support for the gun rights group after suggesting months earlier he was open to some firearm restrictions. His message in front of the adoring crowd was a stark departure from the defiant tone he took toward the NRA in the immediate aftermath of the Feb. 14 shooting at a Parkland, Florida, high school, when he embraced tougher gun restrictions and proudly boasted that the powerful gun lobby has "less power over me" than Republican lawmakers. But any streak of independence from the NRA was gone Friday, as Trump allied himself with some of the gun group's biggest priorities in a rambling, 45-minute speech that focused as much on his foreign policy agenda, approval ratings and the latest in the Russia investigation as it did on gun policy. "The people in this hall have never taken our freedom granted. Never," Trump said. "And you have never stopped fighting for our beloved Constitution. Incredible people." Trump endorsed a top NRA goal to allow trained teachers to carry concealed weapons and to install more armed security guards in schools. Signs declaring a school as a gun-free zone, Trump argued, were essentially invitations to attackers to "come in and take us." "They love their students and they're not going to let anybody hurt their students. But you have to give them a chance," Trump said. "In America, we trust the people to be wise and good . . . that is why in America, we've always trusted the people to keep and bear arms." But Friday's speech was his first appearance before NRA members since the Parkland shooting, which created a new wave of momentum for the gun-control movement nationwide led by the students at Marjory Stoneman Douglas High School themselves. The massacre moved Trump to flirt with stricter gun measures that collided with NRA priorities, such as raising the legal age to purchase AR-15s and similar types of rifles to 21 and expanding background checks to guns sold at shows and online. In a meeting with lawmakers, Trump even mocked Republican lawmakers over the power of the gun lobby, telling one GOP senator he was "afraid of the NRA." But Trump quickly backtracked, instead embracing modest gun-related measures such as legislation to improve information sharing for the National Instant Criminal Background Check System. That bill, known as the Fix NICS Act, was signed into law as part of a government spending measure in March. Trump gave no indication Friday that his gun agenda would diverge from policies embraced by the NRA. He began his remarks lavishing praise on the crowd and the group's commitment to the Second Amendment, saying "the people in this hall have never taken our freedom for granted." "Your Second Amendment rights are under siege," Trump told the NRA members, whom he referred to as patriots. "But they will never ever be under siege as long as I'm your president." To bolster his case for arming teachers and adding guards, Trump argued "there is no stronger deterrent for a sick individual than the knowledge that their attack will end their life and end in total failure." An FBI study of active shootings has found that mass shootings frequently end when the attackers kill themselves. Trump also denounced European cities with tougher gun laws, invoking the November 2015 massacre in Paris to make a case that "if one employee or just one patron had a gun," the citywide attack could've been stopped. Though he has made similar comments before – most notably after the June 2016 massacre inside Pulse nightclub in Orlando, Florida – several recent high-profile shootings have occurred despite the presence of armed officers in or around the premises. "Donald Trump has allowed his presidency to be hijacked by gun lobbyists and campaign dollars," former Rep. Gabrielle Giffords, D-Ariz., who was shot in the head during a constituent event in 2011, said in a statement Friday. "As a result, the threats to our kids and our communities remain unaddressed." While Trump used the speech to firmly embrace the NRA's agenda, he also treated it like a campaign rally – urging members to vote in the midterm elections, boasting about the improving unemployment numbers, touting the recent tax cuts, criticizing the media and lambasting the investigation into Russia's meddling in the election. "So we have the best employment numbers we've virtually ever had," he said. "And yet all we hear about is this phony Russia witch hunt. That's all we hear about, isn't it?" Trump invoked his usual red-meat rhetoric on immigration, complaining that the United States has the "worst laws" and vowing to protect the nation's borders. he called on Congress to change immigration laws that determine who can legally enter the country. "They're going to come in based on merit, not based on picking someone out of a bin," he said of the impact of his proposed policy changes. Trump said great things were about to happen on North Korea and criticized past administrations for their poor negotiating skills, while mocking John Kerry for breaking his leg during a bike ride when he was serving as secretary of state. Trump also claimed polling data shows his support among African Americans is rising, something he attributed to recent supportive comments from hip-hop artist Kanye West. "We have great love going on in this country," he said. Signaling a new, escalated phase of midterm politics, Trump called out several Senate Democrats up for reelection by name – Bill Nelson of Florida, Jon Tester of Montana and Robert Casey Jr. or Pennsylvania – and urged the crowd to elect more Republicans. "Democrats and liberals in Congress want to disarm law-abiding Americans at the same time they're releasing dangerous criminal aliens and savage gang members onto our streets," he said. Joe and Connie Henderson of Tucson, Arizona, applauded throughout. Joe Henderson said he agrees with "90 percent" of what Trump says, particularly on immigration and guns. And Connie Henderson said Trump said exactly what needed to be said on guns. "I think he's right on the mark," she said. "We do need to stand up. We do need to vote more Republican. We do need to get rid of the people who want to get rid of our rights." The Washington Post's Katie Zezima in Dallas and Mark Berman in Washington contributed to this report.